The eighth episode of the Yes Music Podcast featuring the seventh studio album, ‘Relayer’. What difference does Patrick Moraz make on keyboards? What’s difficult about ‘Sound Chaser’? How does the album hang together? Apologies to Patrick Moraz and anyone else offended by me saying in the episode that he is French when he is, of course, Swiss. Thanks go to Graham Warren once again as official YMP fact checker! Very clever to have put in a mistake in Episode 8 – Relayer – just to test if we are really listening. At 10:49-52 you say “I only reach to look in your eyes sings wakeman”. ….surely not, especially on this album? seriously though, great job on looking at the tracks, yoiu have renewed my interest in TfTO and Relayer which have always been my “least played” Yes albums. Maybe its age but I get a lot more out of them now. 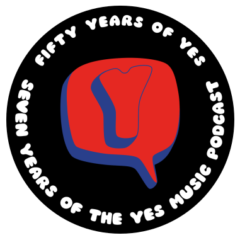 keep podcasting, I look forward to hearing the Yes Music Podcast each week. One of the best things about doing this podcast is the number of knowledgeable and eagle-eared people listening! (Not sure you can be eagle-eared, can you?) So thanks for this spot. As you say, that wouldn’t be Wakeman, would it? Obviously… Anyway, thanks so much for the comment, once again, and it’s great to hear you are keen to keep listening! Relayer is one of my favourite albums by any group. Your show really did it justice. Thanks for the name-drop!